The UCLA Latin American Institute is sponsoring a lecture on the history of chocolate and workshops on the Mexican art form of paper cutting at Avenue 50 Studio in the Highland Park neighborhood of Los Angeles. Cocoa beans in a cacao pod. (Photo: Keith Weller.) Image No. K436-14, Agricultural Research Service, USDA. “Chocolate and papel picado have a long history in the Americas and are the result of an exchange of ideas and cultures,” said Cynthia Gomez, outreach coordinator at LAI. UCLA International Institute, March 18, 2015 — Interested in the history and culture of Latin America? Have a sweet tooth? You can combine those pleasures at an upcoming community lecture on the history of chocolate in Highland Park on Sunday, March 29 at 2:00 pm. Sponsored by the UCLA Latin American Institute (LAI) at the nonprofit arts organization Avenue 50 Studio, the event is free and open to the public, but an RSVP is required. Audience members will taste a small sampling of chocolate while listening to a history of its impact and uses. Consumed by millions and considered a sweet in many parts of the world today, the story of chocolate begins with cacao, known to the Mexica (Aztecs) as cacahuatl. The LAI-sponsored lecture will offer an engaging multidisciplinary look at cacao’s history and heritage from its origins as a spicy, savory food consumed primarily as a beverage in ancient Mesoamerican societies, to its journey across the Atlantic and transformation into a simple chocolate bar. 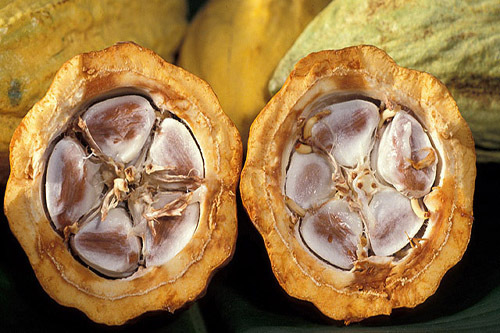 “Cacahuatl: The Origins and Global Impact of Chocolate” won't be standard academic fare. The event will feature presentations by a historian (Manuel Aguilar), a chef (Maite Gomez-Rejón) and a local chocolate maker (Patricia Tsai). Aguilar is professor of Latin American Studies and art history at California State University, Los Angeles; Gomez-Rejón, a chef and founder of ArtBites, a website that publishes a culinary history blog and recipes, as well as organizes cooking classes; and Tsai, the owner of ChocoVivo, L.A.'s first bean-to-bar chocolate shop. The public lecture is part of LAI’s ongoing community outreach activities, which seek to share the latest research findings on the Latin American region with Los Angeles residents. The Avenue 50 Studio event evolved out of a larger, two-day professional workshop (“Chocolate in the Americas”) that LAI is offering to K–12 educators over two weekends this month. “The collaboration with Avenue 50 Studio is an extension of the UCLA Latin American Institute’s outreach efforts to create a better understanding of Latin American history and culture through initiatives that extend beyond the UCLA campus,” said David Arriaza, executive director of LAI. The Institute is dedicated to supporting UCLA faculty and students that conduct research on Latin America. “Our federally funded Title VI grants have allowed us to share faculty research and expertise with the K–16 community to encourage and support the infusion of Latin American Studies into the curriculum,” he added. LAI and Avenue 50 Studio are also collaborating on a series of workshops on papel picado, a Mexican paper-cutting art form. Led by master artist Margaret Sosa with major funding from the Alliance of California Traditional Arts, each workshop consists of five sessions that are free of cost to participants. Both workshops were fully registered within days of being announced, with the first ending on Sunday, March 29, and the second starting on Saturday, April 25. Trace the history of chocolate from its birthplace in Mesoamerica to its global spread in this free community event.